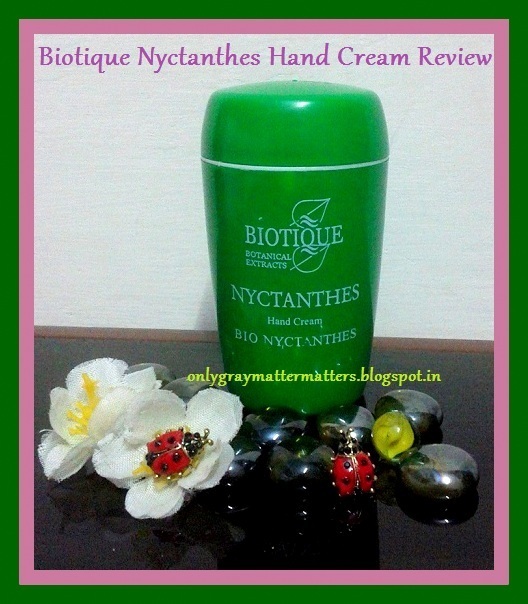 This is a review of Biotique Bio Nyctanthes Hand Cream. Parijat Patra Kwath 2%: Parijat = Night-flowering Jasmine or Nyctanthes, known in India as Harsingar. Patra = Leaves. Kwath = Decoction. Now I am not sure if this contains the extracts from the leaves of the plants or the petals of the fragrant flower because the cream smells of the flower. Manjishta Kwath 3.2%: Manjistha consists of dried stem of Rubia cordifolia. Highest discount on medplusbeauty.com: INR 153 and INR 459 respectively) The price and quantity is exactly the same as the Biotique Costus Foot Cream tubs. Best Before: 3 Yrs from Mfg. 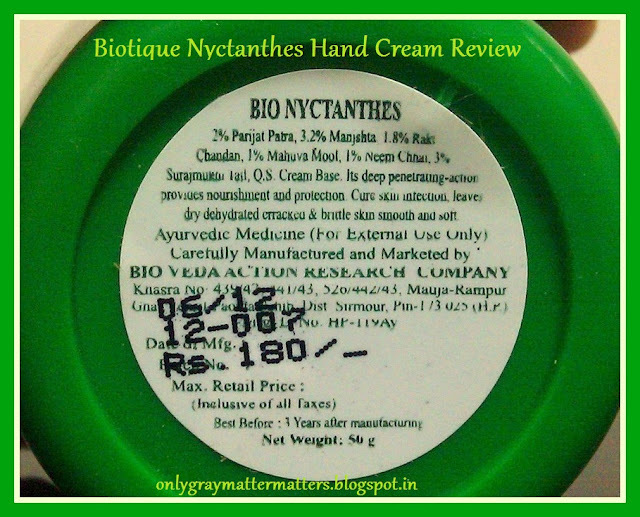 After getting great medicinal results from the Biotique Costus foot cream, I thought of giving this hand cream a try. I started using this in September end and even though it was quite hot and humid then, I needed a hand cream because 1. I have extremely dry skin 2. Having a toddler and pets makes it unavoidable to wash my hands with soap every few minutes. So my hands need good moisturization even in summers. The actual quantity is just 65% of the tub you see above. The first thing I loved on opening the pack was the fragrance and the color. The cream is a lovely peachy pink and the fragrance is just out of the world. I have never in my life smelt such a soothing floral scent. I just can't resist sniffing my hands on and on continuously, when I have applied this cream. I especially enjoy sniffing this to sleep at night. But apart from pleasing my senses of smell and sight, did it actually work on my hands? This hand cream penetrates better when applied soon after bath. Initially, I applied it religiously everyday after bath and at night. It made my hands soft and beautiful. 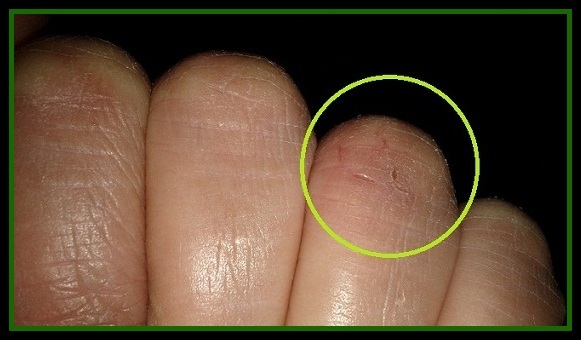 I rub it thoroughly in the gaps between my fingers and also into my nails and cuticles. Just like the Biotique foot cream, this hand cream has also strengthened my nails. For the first time in 4 years, I have been able to keep long nails without them splitting into layers. My cuticles are healthier than before. It kept my hands well moisturized, soft and glowing during summers. 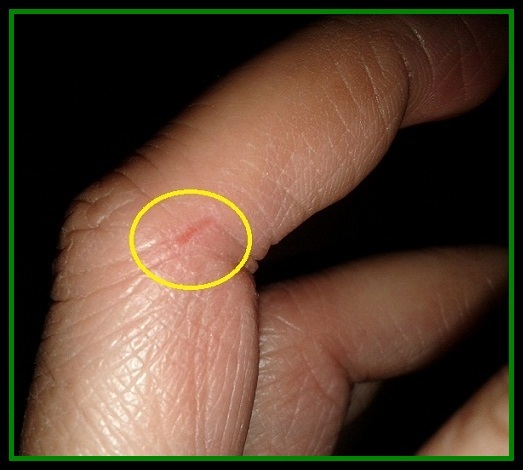 By Oct end, it gets colder here and my hands and palms start developing painful cuts from over washing and dryness. My knuckles go dry and purple in winters. It is Nov end and real winter is yet to hit. But already this cream is not able to keep up to its claims. Nyctanthes hand cream has not been able to treat these cuts even after applying lavishly, several times in the day and at night. I woke up a few days ago with a bad dry rash between my ring finger and tall finger, but this cream could not heal the rash too. So I feel the claims to cure skin infections and dry, dehydrated, cracked brittle skin have failed completely. 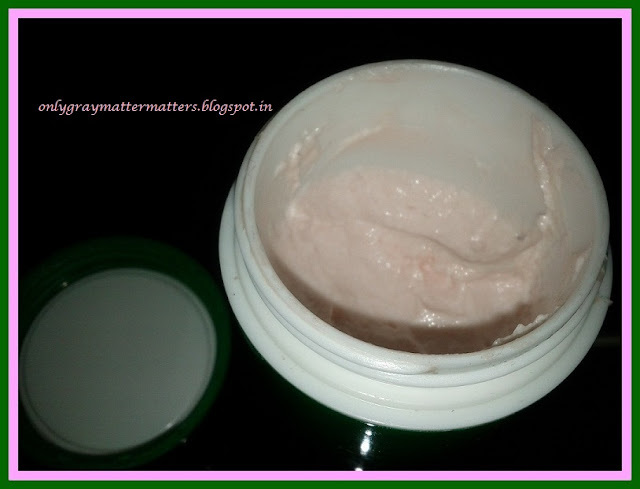 Such skin needs both oiliness and moisturization and this cream does not have even a trace of oiliness. 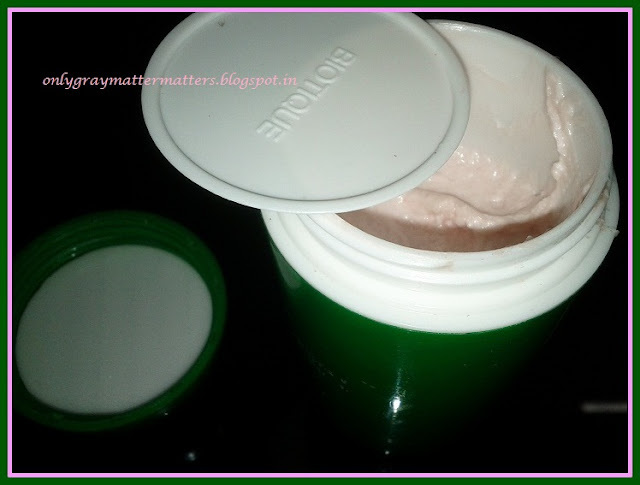 It does beautify my very dry hands instantly and makes my skin look nourished. The dryness on my skin is quite visible here. After blending. See the glow? If I run my nail on this, I don't get a white streak. My hands look pink and healthy. But it does not provide long time results in cold weather, because it lacks essential oils. The moment I wash my hands with soap, my skin returns to it's dry and brittle condition. I had bought this hand cream because of the claims and the absence of chemicals and preservatives. But with such results, it is definitely over-priced. I can apply hot ghee at night and get my wounds treated much faster and even body lotion provides deep nourishment to hands. For Summers and for my nails, this will still be my favorite product, but for winters, I definitely need another hand cream now. If you know of a great hand cream for winters, please do share the details in the comments below. 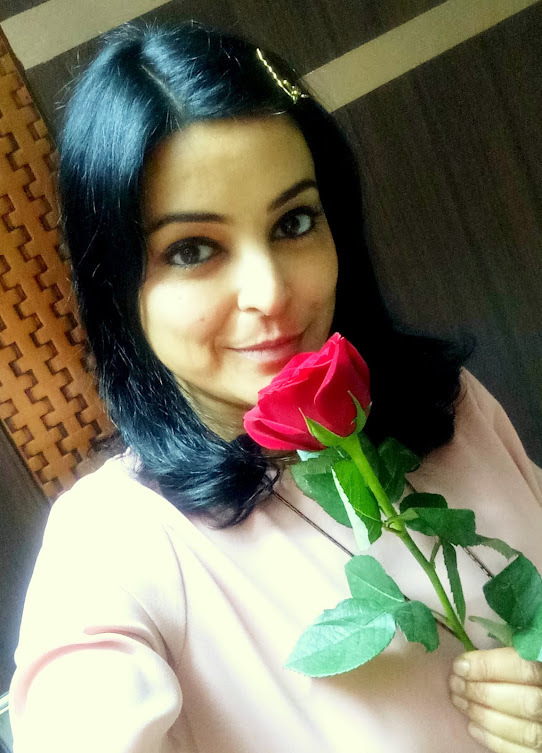 Thanks Tej and thanks for sharing the posy :) Good product but not effective for winters. Cheaper products work much better. Thanks for sharing about your present hand cream. I completely agree, Boroline is still the best cure for all these and I use it daily in winters. I am wondering why I didn't strike me for a week now to apply it on the wounds :) So glad you reminded Ruby! Awww thank you for feeling my pain. But it happens every year :( my skin is so dehydrated, i don't drink enough water and have more tea, I guess that's why. Ahhh you will definitely love it's smell I bet, just heavenly. Thanks for sharing about your winter product Niesha. 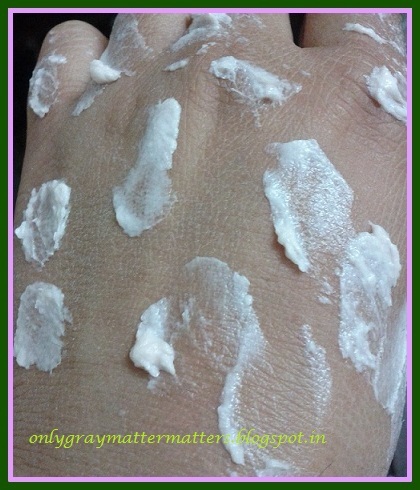 I think I am also gonna stick to body lotion for winters, that absorbs faster and heals dryness quickly. i do not have very dry skin so they do a good job, but i want to try it too. 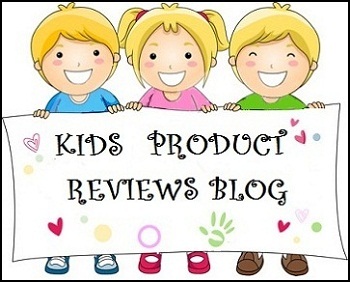 such a wonderful review with pictures..justifies the blog name..keep it up dear !! Thanks a ton Preethi. How come I saw this comment today after almost a year. Hi Gagan - I love this one too! 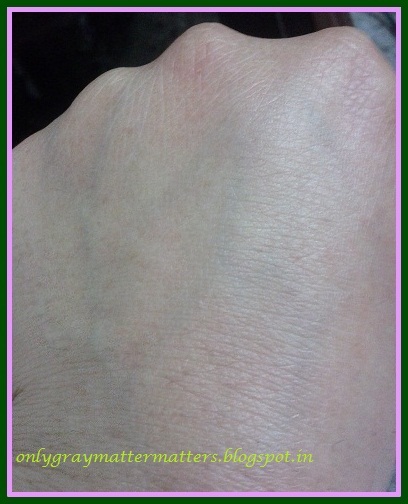 I have a similar dry skin skin issue like yours, again, due to frequent need to use soap on hands. 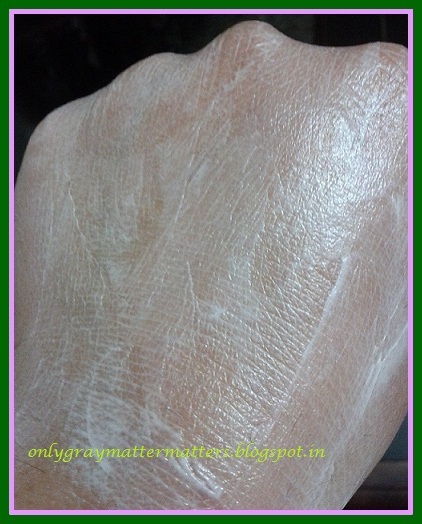 Washing hands is almost an OCD with me, so dryness of my hands must be much worser than yours:-) Hence, thought of sharing my all time sucessful winter handcare tip with you, in case it helps. Have Biotique handcream & Khadi moisturiser packets almost everywhere in my house so I can reach out to one, whenever I need. That helps too! Wow, thanks Deeps for sharing this amazing tip. I had tried some Khaadi products when I was in Delhi and liked them. But later I found different products manufactured under the same brand name Khaadi, with different quality, so I got suspicious of this brand and moreover they don't give the full ingredients list. So I didn't purchase anything from them again.